Those who are interested to work on Hadoop, One commonly asked question that I got from these people is what Hadoop feature can I work on? Here are some items that I have in mind that are good topics for students to attempt if they want to work in Hadoop. Ability to make Hadoop scheduler resource aware, especially CPU, memory and IO resources. The current implementation is based on statically configured slots. Abilty to make a map-reduce job take new input splits even after a map-reduce job has already started. Ability to dynamically increase replicas of data in HDFS based on access patterns. This is needed to handle hot-spots of data. Ability to extend the map-reduce framework to be able to process data that resides partly in memory. One assumption of the current implementation is that the map-reduce framework is used to scan data that resides on disk devices. But memory on commodity machines is becoming larger and larger. A cluster of 3000 machines with 64 GB each can keep about 200TB of data in memory! 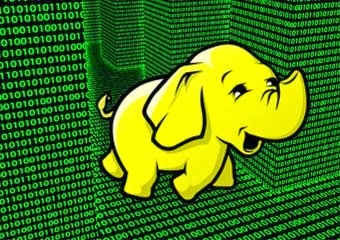 It would be nice if the hadoop framework can support caching the hot set of data on the RAM of the tasktracker machines. Performance should increase dramatically because it is costly to serialize/compress data from the disk into memory for every query. Heuristics to efficiently 'speculate' map-reduce tasks to help work around machines that are laggards. In the cloud, the biggest challenge for fault tolerance is not to handle failures but rather anomalies that makes parts of the cloud slow (but not fail completely), these impact performance of jobs. Make map-reduce jobs work across data centers. In many cases, a single hadoop cluster cannot fit into a single data center and a user has to partition the dataset into two hadoop clusters in two different data centers. High Availability of the JobTracker. In the current implementation, if the JobTracker machine dies, then all currently running jobs fail. Ability to create snapshots in HDFS. The primary use of these snapshots is to retrieve a dataset that was erroneously modified/deleted by a buggy application. The first thing for a student who wants to do any of these projects is to download the code from HDFS and MAPREDUCE. Then create an account in the bug tracking software here. Please search for an existing JIRA that describes your project; if none exists then please create a new JIRA. Then please write a design document proposal so that the greater Apache Hadoop community can deliberate on the proposal and post this document to the relevant JIRA. If anybody else have any new project ideas, please add them as comments to this blog post.